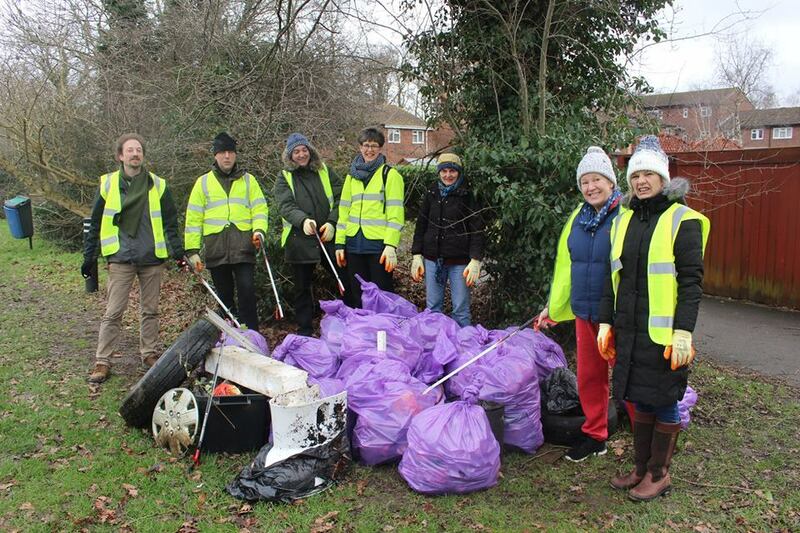 Councillor Hal Brown, Councillor Jonathan Essex, Green campaigner Ruth Ritter and five volunteers tackled the litter on Whitebushes Common on Sunday 27 January. After stretching through brambles, wading across muddy ditches and contorting aching body parts to reach awkward corners of undergrowth, an impressive pile of bin bags was generated. A tyre and even a toilet was dragged out of the undergrowth, which frankly made the mind boggle. There was still more work to do when the session ended. It was disheartening to see how thoughtless some people can be when it comes to disposing of rubbish. The number of cans and bottles thrown into ditches and hedges was truly shocking, especially when there are bins on the Common and recycling bins in Whitebushes. However, the litterpick highlighted the need for more bins on the Common, particularly on the section of Common opposite the playing field. This is an issue Councillor Hal Brown and local Green party members will investigate with Reigate & Banstead Council. Reigate & Banstead Council spends over £1m each year removing 1,407 tonnes of litter from 1,400 streets. But some areas are hard to access and clean and require extra help. The litterpick highlighted the power of community action in tackling local problems; whether that be a group of volunteers on a chilly Sunday morning or the local Scout group earning their badges. Litterpicking is also sometimes undertaken by offenders doing community service. But if this initiative is not an option it then falls to community groups to make a stand and arm themselves with hi-viz jackets, gloves and grabbers. The amount of litter on the Common underscored the need for regular action. So Councillor Hal Brown will lead a Green team to make this a regular event across Earlswood & Whitebushes. We all want to live in a cleaner environment and all it takes is a sense of communal responsibility. That sense of social responsibility might manifest itself in taking part in a litterpick, or simply encouraging children at an early age to dispose of rubbish in the correct way. And some people need reminding that it is an offence to drop litter of any kind under The Environmental Protection Act of 1990. Residents should report littering and flytipping to Reigate & Banstead Council, whose Joint Enforcement Team should provide a quick and robust response to such anti-social behaviour, now called ‘envirocrime’. Thank you to all the volunteers who took part on Sunday and to Reigate & Banstead Council for providing the equipment and bags.